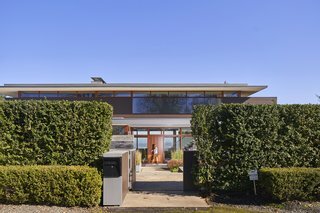 Known for its unrivaled views, a ranch-style home in Portland, Oregon, gets a glass-centric overhaul. When Greg Hoffman and Kirsten Brady decided to give up their Tudor-style home in Portland, Oregon, and go modern, their preference was initially to build new. Then, at their realtor’s suggestion, they went to see the view from the so-called "View-Master House" in the Council Crest neighborhood, the highest point in the city. Designed in the early 1950s by architect Roscoe Hemenway for inventor Karl Kurtz—who developed stereoscopic devices for Sawyer’s, maker of the famous View-Master toy—the house offered a panoramic vista of both the downtown and snow-capped peaks of the Cascade mountain range in the distance.